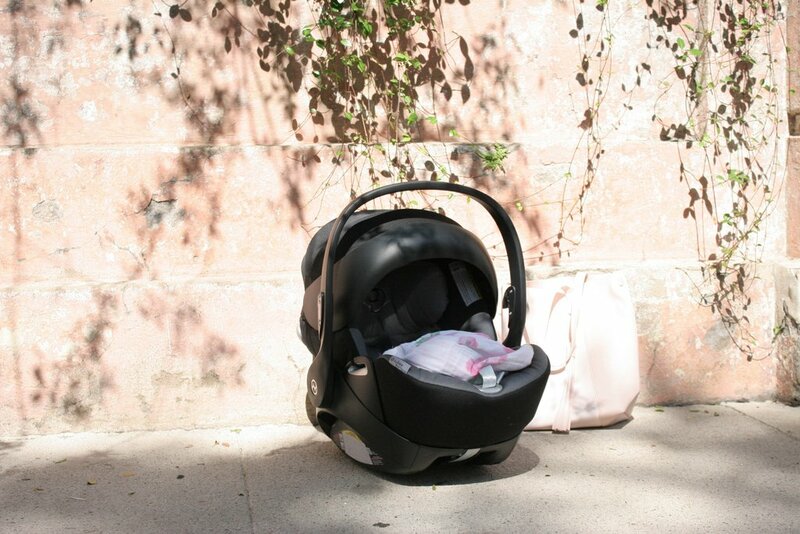 Baby Registry Must-have: Cybex Cloud Q car seat – Little Adi + Co. If it’s one thing that all parents have in common, it’s wanting their child to be as safe as possible. I have always tried to stay as up-to-date as possible when it comes to products that would further ensure my kids safety. With baby #3 on our radar, I’ve been even more in tune to what’s hitting the market. So when Cybex asked me to review their Cloud Q infant car seat, I jumped at the opportunity. This may just be exactly what I have been needing all of these years! As a parent, it feels like we make constant trips to the store to replace what our little ones are outgrowing. One of the best features of the Cybex Cloud Q infant car seat is that is has 11 adjustable positions in order to fit our children as they grow. I can’t tell you how good it feels to know that we have an option that lasts longer than a few months. Outside of the adjustable size, the Cybex Cloud Q car seat has a unique and sleek design that allows your child to lie or sit in an ergonomically correct position. I’ve seen children in car seats before and thought how uncomfortable their poor necks looked. Due to this amazing ergonomic design, children are able to lay with their neck and head in a comfortable position without risk of it tipping forward. This feature is pretty much a dream come true! My kids were always carseat nappers, so this function is crucial to all of our well-beings. Now, let’s not forget the XXL foldaway sun canopy that perfectly shields the sun from your baby while in the car seat. Whether in the car or out and about, the Cybex Cloud Q infant car seat adjusts so your child is safe, comfortable, and ready for any situation that may occur. I’m in love with the “armadillo” canopy! Something I always had to do with Aden was drape a muslin blanket around his seat to shield the sun. With this, it’s not necessary. Who would have thought? A canopy that actually does what it’s made to do! I’m sure I connect with all parents when I say that it can be tough when trying to decide on the perfect items for your little ones. When I was a brand new mom, I wanted to stay current but also give my child the world while keeping safety at the top of the list. Due to this pickiness, it took me forever to decide on anything because I wanted to feel confident in my choices. With the Cybex Cloud Q infant car seat, I’m definitely reassured that my baby is in the best seat possible. In fact, this car seat will make me a pretty cool mom because of how modern and sleek the design is. Summer is so close and although summer is not officially here, it feels like it is. As it stands, we are already excited for the summer adventures we have planned. As I plan our summer travels, it always takes me back to the days when we had to travel for the first time with our first baby. There was a lot of firsts going on and it was without a doubt, scary. However, I smile when I think about how much easier a lot of those tasks come when you have the right item. The Cybex Cloud Q infant car seat knows how much of a struggle new parents can have and that’s why they have covered every detail, right down to the foolproof strap that secures the seat in the car. No more struggles in the backseat trying to install the dreaded thing! The bottom line? Cybex is a top of the line brand and their products are nothing short of the best. I’ve definitely been recommending it to all my pregnant friends and I can’t wait for our next little one, so I can use it again.